"April 23 Children's Day" founder and first president of the Republic of Turkey has been a gift to the world's children by Mustafa Kemal Ataturk. The closing date of the exhibition and competition is 06 April 2018. Pre-Selection Committee (İlhan Özdemir, Mehmet Saim Bilge and Agim Krasniqi); They will meet in Istanbul on April 08, 2018 and they will do first prize. 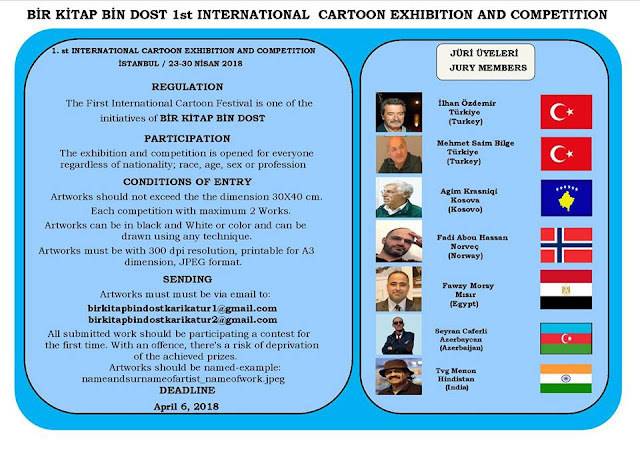 The first preliminary cartoons will be sent to the jury members by e-mail on April 10, 2018. The jury will complete the elections by April 20, 2018. Selected cartoons will be displayed between April 23rd and April 30th. Cartoons at the exhibition will take place in the "Cartoon Brochure" which will be published in the May issue of "Bir Kitap Bin Dost". Contest Album will be developed in pdf and, if sponsored, will be printed. Prize-winning cartoons will receive a "certificate of appreciation" and a "certificate of appreciation and participation". "Thank you and participation certificate" will be sent to all caricaturists who will take part in the exhibition. A "Bir Kitap Bin Dost Honor Certificate" will be sent to all jury members along with "thank you" documents. 0 Response to "Bir Kitap Bin Dost 1st International Cartoon Exhibition and Competition"